"The LGTBQ community should not live on the fringes of the society anymore. 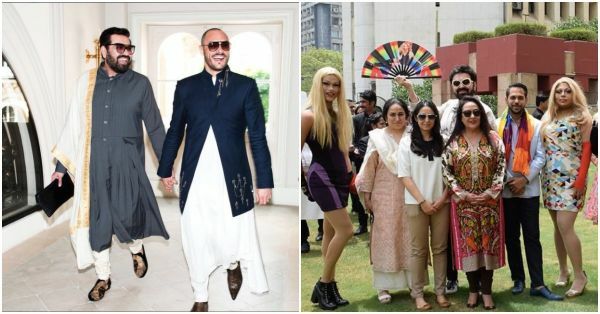 We shouldn't just be in the basement of a nightclub, but walk freely being ourselves out in the open," Keshav Suri, Executive Director, The Lalit Suri Hospitality Group, rejoiced after SC scrapped out Section 377. It is a huge step for the country towards equality and acceptance for the community. Keshav has been openly gay for a couple of years now, but he lived under the fear of false accusations when Section 377 was still in play. Despite the fear of being ostracised, Keshav married his longtime partner, Cyril Feuillebois last year in Paris. Suri filed a petition in the SC challenging the Section 377 of the IPC and he also ran a social media campaign called 'The Pure Love' in December 2017 to create a platform for diversity and inclusivity. The 33-year-old hotelier is also the owner of the nightclub Kitty Su, the club known for its weekly performances by drag artists, queer dancers and singers. It is one of the only LGBTQ nightclubs in India. After the verdict came out, Keshav and his partner Cyril hoisted a rainbow flag to celebrate the first step towards equality and respect for the community. Keshav spoke to POPxo about his struggles, the first time he came out to his parents and the challenges that the community might still have to face. "I've had many struggles. Of course, being out and being a part of the corporate world as well as a board of director, it took me a lot of time to accept myself and get my team to accept me. Only after it happened, I was able to file this petition. People think that it's easier, but it's not. I had to first prove to my team that I'm actually worthy of the position that I'm in and the fact that I'm not a professional homosexual. That I can run a successful business, it took a while but now I'm here," he said. "It wasn't easy to come out to my parents, but it also had to do a bit with the lack of education. But my mother was amazing. She took a choice and said, "If I want to be in my son's life, I'm going to make sure that I'm going to accept it." Not everyone or every parent does that and in India we put a lot of pressure on parental acceptance. I would really like the community to not focus on that if possible." "Take your time. If nothing else, know that there are places where you can feel safe and be yourself. There's an army of people behind you, there are counsellors from Humsafar Trust and other places you can find support. You've got a tribe of people, a family, so don't worry." "What is going to happen about societal acceptance? It's going to be a bit of a challenge. But right now, let's celebrate! Screw the challenges, this was the biggest challenge."